The debate over the dual player at county level is one that continues to cause divide amongst the GAA fraternity. The demands of a GAA player in one code are immense, let alone trying to juggle both. Certainly, the dual player is a dying breed and there are only a handful of players plying their trade at the highest level in both codes at the moment. 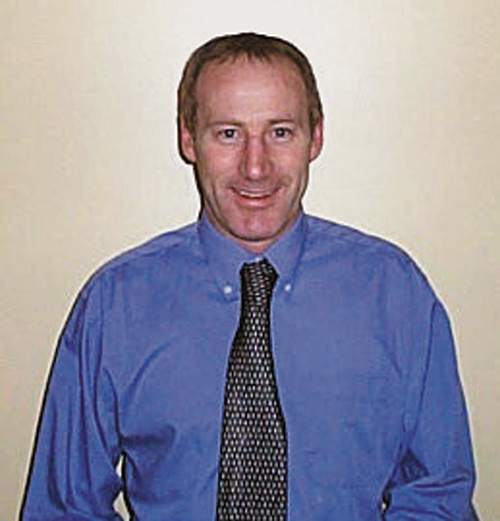 One man who tasted the dual status is former Armagh hurler and footballer Martin Lennon who represented his county in both codes during the eighties and nineties. Martin admits that even during those times, it was difficult to combine both, especially with work commitments and a young family at home. "I actually only played both for one year in the mid eighties. I just found it too difficult to combine both. I had been with the hurlers for a few years first before joining the football panel 1986-1990. I went back with the hurlers for five years after that," said Martin. "It was difficult trying to combine two training regimes even though there was flexibility shown by both managers at the time. Since then training has intensified at county level and the physical demands on players are far greater and I don't know how any player attempts to combine both codes today. At the end of the day, many of these lads still have to get up every morning for work. It's certainly a cause for concern." As a past player, Martin is unsure about the controversial black card that has been introduced to the game this year. "I think we will learn more about the black card as the championship goes on, but at the moment, I don't think it has harmed the game. In fact score averages have increased during this league season." 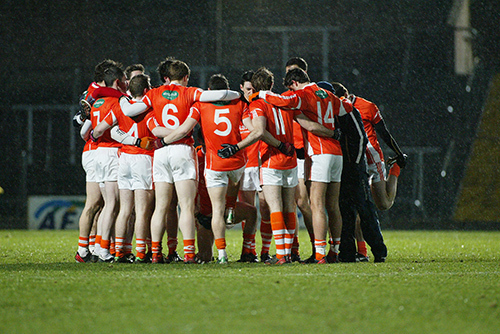 Martin hails from a GAA family as he and his brothers John, Michael, Mattie, Tom, and Oliver all lined out for the Derrynoose club in Armagh in both codes. John is the current manager of the Armagh hurlers, while Mattie is a former Armagh manager and the present Tyrone hurling manager. 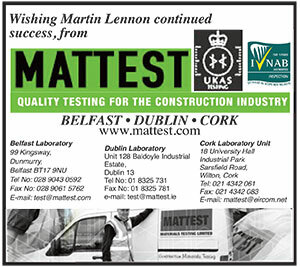 So would Martin like to follow in their footsteps? "Absolutely not, due to work commitments," was the resounding reply. 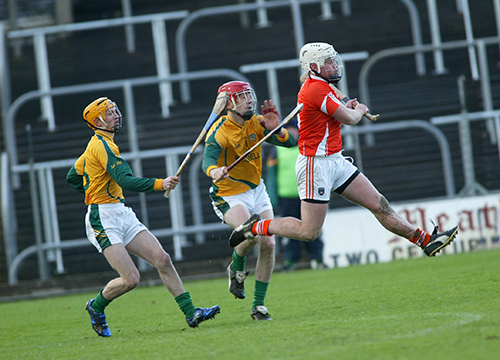 "I'm living in Newry and I do a bit of hurling coaching with the Shamrocks at minor level. My son Niall plays hurling and football with them and they have a good little team and I'm happy enough to be involved with just them at the moment." 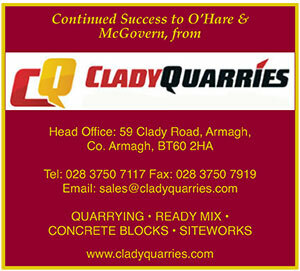 Martin is General Manager of renowned building firm O'Hare & McGovern Ltd. 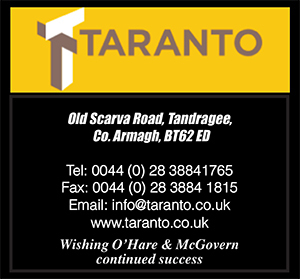 The company is one of the leading construction firms on the Island of Ireland and they are involved in many prestigious developments both here and the U.K.
"The company has multiple projects ongoing here in NI, ROI, UK and the Isle of Man. These projects include work for the University of Limerick and Drogheda Council in ROI, also a high rise residential development in London, to name but a few. We have a long association with Queen's University in Belfast and are currently constructing a centre for experimental medicine. 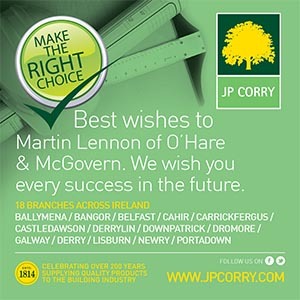 We are very busy at the moment and delighted to be so."